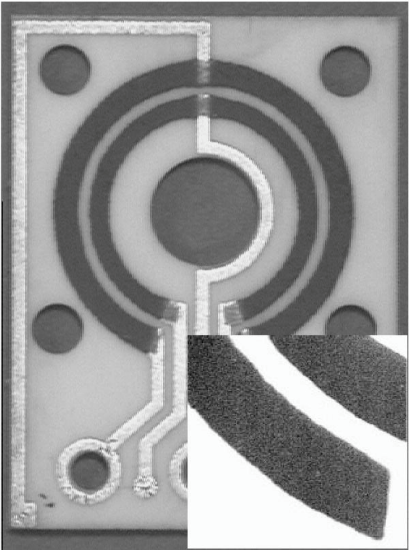 Contact-less magnetoresistive field sensor made of thick LSMO film by using the screen-printing technique. Inset: Detail of the LSMO thick film. Modern cars are plenty of magnets everywhere from braking systems to inside climate control. Magneto-resistive properties of complex oxide, such as the well-known La2/3Sr1/3MnO3 (LSMO) perovskite, can be used to implement low cost magnetic sensors. At ICMAB at Barcelona, by using the easily scalable screen-printing technique, a magnetic field sensor has been designed to optimize the magneto-resistive response at room temperature. The performances of this sensor has been tested in our magnetometry platform. These sensors are suitable for sensing vehicle control systems like steering, road speed, inertia (crash detection and airbag deployment), throttle, engine speed, and others. The atomic scale control of magnetic thin film deposition, as well as their structural, magnetic and electrical characterization in micronic and nanometric size systems, has recently enabled the development of new high performance magnetic sensors based on magnetic tunnel junctions. These sensors cover a wide range of needs (HDD read head, speed sensors, etc.). 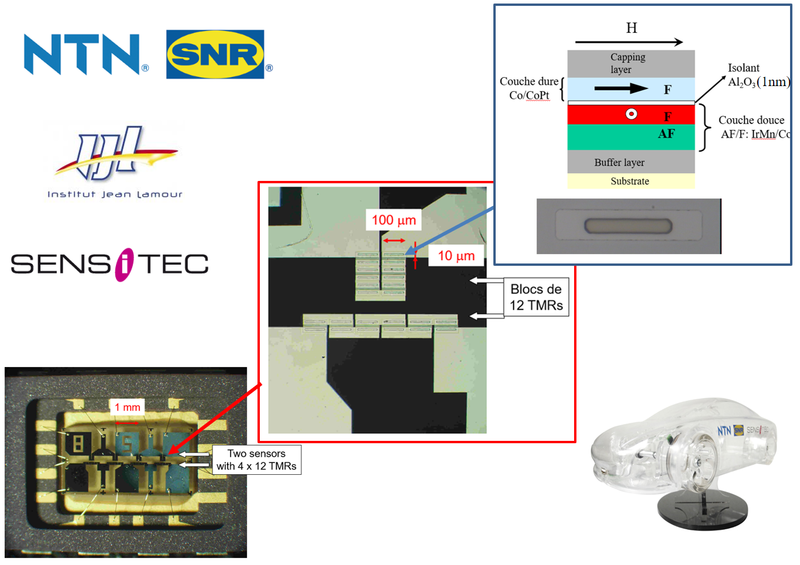 In 2010, Université de Lorraine has worked with NTN-SNR and Sensitec to develop new TMR sensors for cars Active Sensor Bearing (ABS) systems.